A series of bad decisions by insurers means a once-in-a-lifetime coincidence could end up costing airlines millions. After the crash of MH370 in March, the downing of a second plane in Malaysia Airline’s fleet is a lightning-striking-twice kind of occurrence. In fact, it’s so unusual, it’s taken the insurance industry completely by surprise, according to a piece in yesterday’s New York Times, which gives an interesting insight into the strange world of plane insurance. Among the various categories of aviation insurance is ‘war risk insurance’, which usually prevents airlines from flying across warzones. In the case of Ukraine, though, it seems both underwriters and aviation authorities were pretty relaxed about it: the number of flights crossing the country only dropped by 12% in the month before the crash. According to the piece, that cost the airline’s lead insurers, The Atrium Underwriting Group, $97.3m. But that pales in comparison with the mounting costs of MH370. It turns out there’s a standard clause missing in Malaysia Airline’s insurance contract which limits the amount its insurers pay out for search and rescue. Ordinarily, that wouldn’t be a problem, because the tradition is that if an airliner is lost, governments are the ones that pay to find it – but the hunt for MH370 (still ongoing) has become so expensive, an Australian delegation has been sent to Malaysia to see if the airline is willing to share the cost. At the moment, the Australian government is paying AUS$8m (£4.4m) for a survey of the floor of the Indian Ocean, and is planning to pay another AUS$60m to ‘tow deep-sea submersibles across 60,000 square kilometres of the ocean floor’. 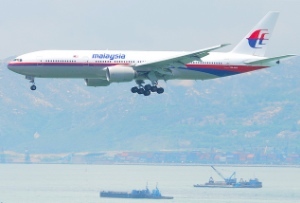 For insurers, which have already paid out $100.2m for MH370, Malaysia Airlines is beginning to look like an increasingly expensive proposition. Particularly given the fact the airline has claimed once before: back in 2000, when a canister in the hold of a passenger aircraft ‘broke open’ near the end of a flight and filled the cabin with a mixture of mercury and other chemicals. ‘A subsequent investigation found that the hold was contaminated beyond cleaning… the Malaysian government ended up digging a large hole in the ground near the airport tarmac and burying the entire plane. Insurers paid a full settlement of $90m’. So could Malaysia Airlines’ recent spate of bad luck end up pushing up the cost of air travel? Perhaps, Gary Moran, head of Asia aviation brokerage at Aon suggests.